If you're interested in trails and conservation in Brevard, North Carolina; you should consider Sylvan Habitat in Transylvania County. Located conveniently close to Asheville NC and Hendersonville NC this trail and conservation development with just 44 lots on 555 acres gives the chance to live in a park of your own. Sylvan Habitat offers over 5 miles of trails and over 200 acres of conservation areas. This is a wonderful place to live, retire or enjoy vacations. If you are considering Brevard, North Carolina real estate; Sylvan Habitat offers the perfect location only five miles from downtown Brevard. And one of the trails goes directly into DuPont State Forest. Sylvan Habitat is blessed with more than 12 sparkling mountain streams, waterfalls and great views of the Blue Ridge Mountains to the Northwest and the Saluda Mountains of South Carolina. A ridge cuts diagonally through the property defining forested valleys on either side. Southerly and easterly exposures predominate giving you the morning sunshine and the warming winter rays. Altitudes range from 2700 to 3100 feet. Dr. Fekete of Atlanta took each and every site into consideration to be sure not only was there a premier home site, but one that took into consideration property land management ideals with modern technology. Most if not all of the sites range from a couple acres to almost 40 and all have to some degree some of the finest views ever to be offered in the Brevard area. 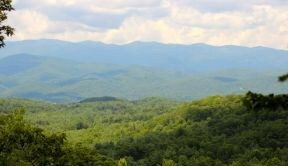 Lot 18 offers spectacular, year round, long range mountain views. This 1.5+ acre lot is level to rolling in which you can see unsurpassed views of the Pisgah National Forest. Lot joins green space and conservation easements of the nearly 250 acres in Sylvan. You will enjoy the trail system along property that gives access to the 5 miles of trails leading into the DuPont State Forest. Join lots 19 & 20 for quest or additional homes. Lot 19 offers breathtaking, year round, long range mountain views. This 1.68+ acre lot has some of the best views in the county of the Pisgah National Forest and the Blue Ridge Mountains. This lot joins trail system along the front of the property that gives access to the 5 miles of trails leading into the DuPont State Forest. With a nearly level torolling building site this lot would be ideal for a basement. Lots 18 & 20 available for an estate parcel. Lot 20 This 1.68+ acre lot offers dramatic, year round, long range, mountain views, of the Pisgah National Forest and Blue Ridge Mountains. You will enjoy the trail system along the front of the property that leads to the 5 miles of trails into the DuPont State Forest. This lot also offers a nearly level to rolling building site which would be ideal for basement. Lots 18 and 19 available for an estate parcel. You should consider Sylvan Habitat in Transylvania County.